CRAZY DISCOUNT! Was: $349.95 Now: $239.96! Spoil your birds with this intricately designed Large Wooden Bird Cage! 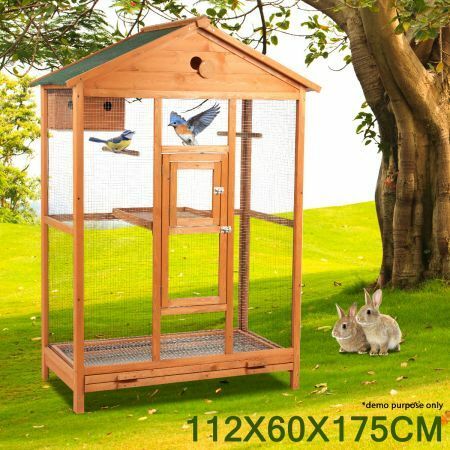 Suitable for small to medium size parrots or birds, this is a beautiful home for your birds with waterproof asphalt roof, beautiful varnish finish and 2 wooden perches. Constructed from beautiful fir wood, this bird cage is sturdy, durable and a pleasure to gaze at. This cage comes equipped with a double perch and 2 lockable doors, as well as a removable food tray. There's also built-in house for a bit of privacy for your birds, should they feel the intimate need to reproduce. This wooden cage is beautiful, and will be a welcomed addition to any yard or outside area. Many bird cages are simply unattractive, but our fir wood bird cages are as stylish as they are practical. Give your special pets a special place to call home, and order your Large Wooden Bird Cage today! 176 x 116 x 14CM approx.